Tonight I'm talking about my favorite cooking bourbon. Some people might think that's an insult. That it means it is a bourbon so bad that all it is good for is hiding amongst other flavors. Nothing could be further from the truth. If I want to enjoy what I eat I had better use quality ingredients. My go-to cooking bourbon will have to meet certain factors and the most important one of them will be that I like how it tastes. The second factor is proof. When I bake, I pull out some water and substitute a little bourbon. You might have noticed that bourbon is much more expensive than water. Hence I want to use as little as possible while still giving me the flavor I want. As you probably know, higher proof bourbons tend to have less water added. As a result, there is also a tendency toward more flavor. Cost and availablilty are the final factors. My go-to cooking bourbon won't be a Four Roses Limited Edition no matter how high the proof or how tasty the bourbon. Nose: Earthy, lots of oak. There is some sweet underneath. Honestly, I'm finding that this smells just like the warehouse on the tour at the American Stillhouse. Mouth: This is a sweet one! Tasted neat, I find this to be mostly caramel and heat. Finsh: Sharp and spicy with a cool mintiness. It leaves a tingle on the tongue that lasts forever. Overall: I like this bourbon, but not for drinking. I really don't like to drink super high proof bourbons. They fry my taste buds way too quick. 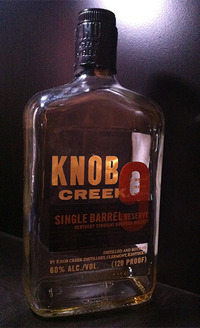 And if I'm going to water it down anyway, I might as well go with the 100 proof Knob Creek and save myself some money. But as my go-to cooking bourbon, I love it. I've used this in my Bourbon Banana Bread and my Bourbon Doughnuts with great results. So this is a tasty bourbon that is interesting in the glass. But for me, the really high proof makes it a meh for drinking. But that same proof makes it a love for cooking. Average that out and you get a like. And I really do like this. I just had to find a way to let it's flavor shine while holding back the proof. And for me that's in food.